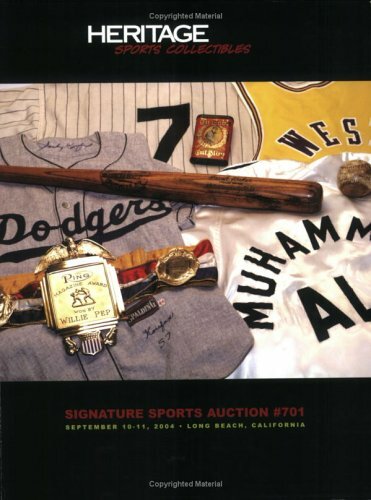 This profusely illustrated auction catalog for the Heritage Sports Collectibles Signature Sports Auction #701, conducted on September 10-11,2004, in Long Beach, CA, is accompanied by a complete list of the prices realized for each item sold. A valuable reference, which makes interesting reading for hobbyists and researchers. Heritage Galleries & Auctioneers is the world's largest collectibles auction house (over $250 million in annual sales), and the third largest public auctioneer in the United States. Heritage specializes in live and online auctions in venues throughout the United States of rare coins and currency, vintage sports collectibles, comic books and comic art, illustration art, Americana, celebrity and music memorabilia, autographs, books, manuscripts, and historical memorabilia. Heritage now also auctions fine American and European paintings and decorative arts. Heritage's website offers free online auction results archives to its 150,000+ registered Internet bidder-members (membership is free), with over one million enlargeable images. Whether you are a collector or a potential seller or consignor, these back-issue auction catalogs from Amazon.com are a perfect way to learn more about Heritage and the collectibles categories and markets that interest you most.